Planning a menu for a garden party wedding is exciting because there are so many different options. You don’t have to fall into the standard cocktail hour with hors d’oeuvres; 3-course dinner; humongous cake trap. 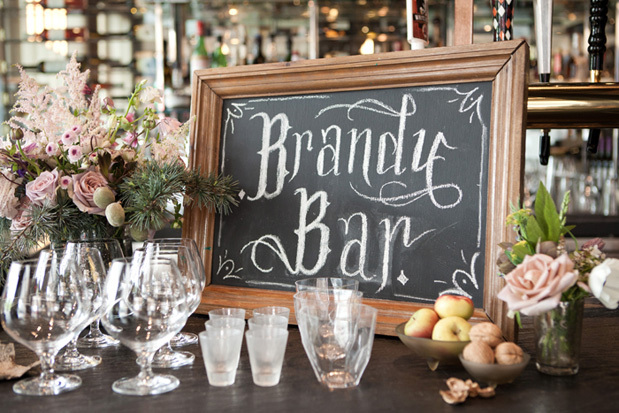 Sticking with your theme, you can have a cocktail reception or even an upscale buffet dinner. The possibilities are endless, which is why I’ve compiled a few tips to help you narrow down your choices. 1. Garden party receptions are often on the rustic, leisurely side of weddings, and a full bar stocked with top shelf liquor isn’t necessary. Instead, serve interesting craft beers, a few different wines and one or two specialty cocktails, like spiked iced tea and a savory martini. You can also have one signature liquor offered, like brandy. For ice buckets that go with the motif, line planters and pots with bin bags and fill with ice. 2. 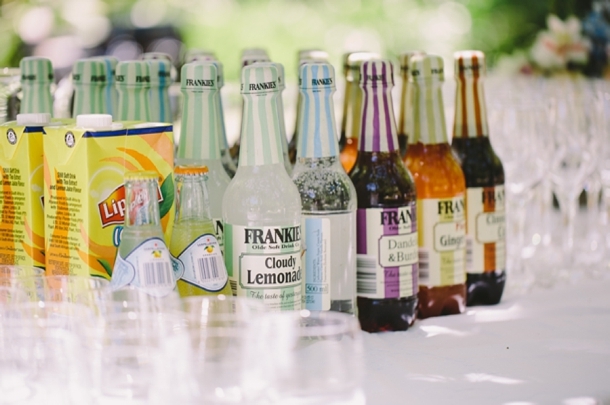 Don’t forget to offer plenty of non-alcoholic options. You can have a little fun here, too – summery, garden party-esque beverages include pink lemonade, black cherry soda and peach tea. Set up a small water bar where guests can punch up their H20 with mint leaves, citrus wedges and berries. You can also freeze juices so guests can add some flavored ice cubes to their drinks. 3. The best foods for an outdoor garden party wedding will be flavorful, easy to eat while mingling and light so that guests don’t feel overstuffed in the heat. Consider adding the following dishes to your wedding day menu: tomato-beet salad, shaved cucumber salad, salmon burgers with yogurt-dill or wasabi sauce, pork-and-veggie kebabs, asparagus quiche and herb panzanella. Anything that can be prepared bite-sized is best, especially if you’re opting for a cocktail reception instead of a sit-down dinner. 4. Garden parties are known for delicious pastries, which means you can really go nuts when it comes to dessert, or even sweets during cocktail hour. Have a spread of meringues, scones and homemade jams. Ask your caterer to make macaroons, miniature jelly-filled donuts and individual pecan tarts. 5. 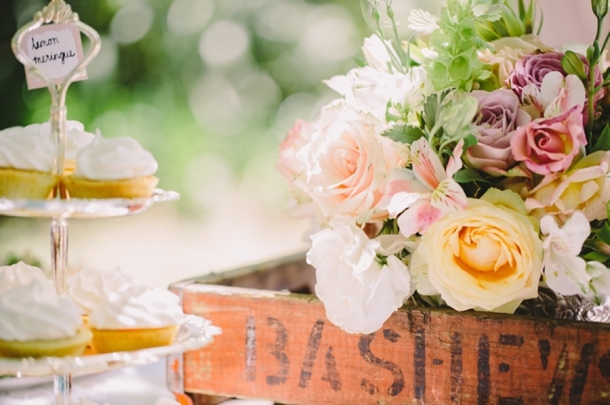 Try decorating with food, especially if you’re having a wedding in the dead of summer. Flowers may wilt outside in the heat, which makes foodie centerpieces much easier to maintain. Fill glass bowls and vases with seasonal fruits and veggies or use desserts as your table decor. If you don’t want your guests to munch on the decorations, make sure that’s clear. You can put a note on the menu or you can have the DJ announce that the displayed food is for decoration only. Otherwise, let guests know when it’s time to dig into their cupcake centerpieces! 6. If you’re going to be serving food outside, it’s best to stick with foods that are yummy and safe at room temperature (or hotter). For example, skip over mayonnaise-based foods and cheese, especially if they’re going to be sitting on a buffet table. If you want to offer foods that have to stay hot or should be out of the heat, ask the caterers to pass them around – don’t let the foods sit on a table for hours.